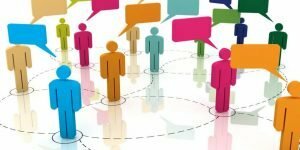 I am going to conclude this short series of articles on communications and directions of communication in project teams, which began with communicating down and communication up, with this, the third and generally most common direction of communication in any project, whether domestic of international, co-located or virtual team, and that is peer to peer communications. Peer to peer communication occurs between similar level personnel within the project framework and will typically cover the majority of all day to day communication. In a traditional co-located project team this would include things such as one-on-one discussions with colleagues, team meetings, exchange of information between teams within the project etc. In virtual teams and international teams these exact same transfers of information and discussions need to take place, but are made more complex by time, distance, cultural differences and any other of the myriad of complicating factors that influence human communications. Perhaps the first thing to acknowledge here is that peer to peer communication is essential to the success of the project, but will not be as intuitive or as easy for a virtual team as having the project team in the same office. Communication must be planned and structured to be successful, and the majority of the planning must be done by the individuals doing the communication, not imposed on them from above by their managers. It is human nature to communicate easiest with those you see around you. Communication by electronic media has only been with us since the end of the last century and mankind, being very visual, tactile communicators, has really not well adapted to this yet, so it will not always be easy and it will take work to communicate to your non face to face peers. Modes of communication involved will typically be email, telephone, video conference if available, fax, though this is becoming less common with the easy of access and deployment of email, text messaging, blogs or any other convenient mechanism. Each of which has their own part to play in the distribution of information and the maintenance of the lines of communication. Regardless of the mechanism used for any communication, the message must be accurate, appropriately delivered, make linguistic sense to all parties and be culturally sensible and sensitive. By this I mean it must not offend anyone on the project to the point where they disengage from the project or react in a hostile or disruptive way. So, for instance, don’t necessarily expect your international colleague to be happy when asked to participate in a phone hook up on a national or religious holiday in their location anymore that you would expect to do so yourself. Take care in the language used in your conversations to maintain an even and balanced level of respect between parties. Do not imply, either overtly or covertly, that you are in a position of authority over your international colleague if this is not actually the case. They may not react to this in the meeting, but you can guarantee that they will change their behaviour in some way as time progresses, either to become defensive, assertive themselves or start to make various internal political moves that will be detrimental and distractive to the project goals. In projects where there are multiple languages involved, maintain as simple a project and correspondence vocabulary as possible, one that all parties can readily understand. Where more complex words and terms are required, explain them, maybe even establish a project dictionary or a project wiki to allow everyone to look things up where necessary and, if you are keeping minutes, consider producing them in multiple project languages. This can be executed relatively simply through the use of many of the on line and commercial translation tools, they may not be perfect but they are usually good enough for the message to be clearly understood. More than anything else, treat your international peers as you would like to be treated yourself, with respect, dignity and understanding. If you are unsure of something being discussed, either ask the question in the discussion, or in a separate conversation. Try not to make assumptions or jump to conclusions over perceived slights or comments and, even if you do feel a little offended in a discussion, attempt where possible not to react, the chances are it is a misunderstanding not an intentional offense. Do you have any experiences communications in project teams you have been a part of that you would like to share? If so, we would love to hear from you.